Yesterday I had the opportunity to talk with a couple who rescue horses. They take in foals which are unappreciated by their owners, raising and nurturing them over the course of 3-4 years. I see some similarities with my cousin and her husband, who have been taking in foster children for nearly 40 years now. They’ve helped the lives of dozens and dozens of kids. The most depressing part of doing work like this is that they realize it’s a mere drop in the ocean. There’s an almost infinite amount of need out there, and your contribution can seem trivially small. You see, it’s about making a contribution where you can. Even Bill Gates, the richest person on the planet, isn’t able to fix everything he’d like to. So he does what he can. There’s seven billion people on the planet, and every person has their needs. Some are truly heart-wrenching. Certainly many more than you or I can address. But realize too that this means there’s seven billion people to help address the world’s problems. What an amazing resource! It’s an almost unlimited potential if we can get things moving the right direction. Don’t get hung up on the magnitude of the need out there. It doesn’t matter. Focus on something that matters – where your gifts can be useful. Find joy in what you are able to do rather than what you aren’t. 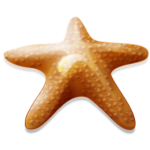 Even if it improves the life of one person, or one horse, or one starfish … that’s enough. Previous Post: Put it out there!